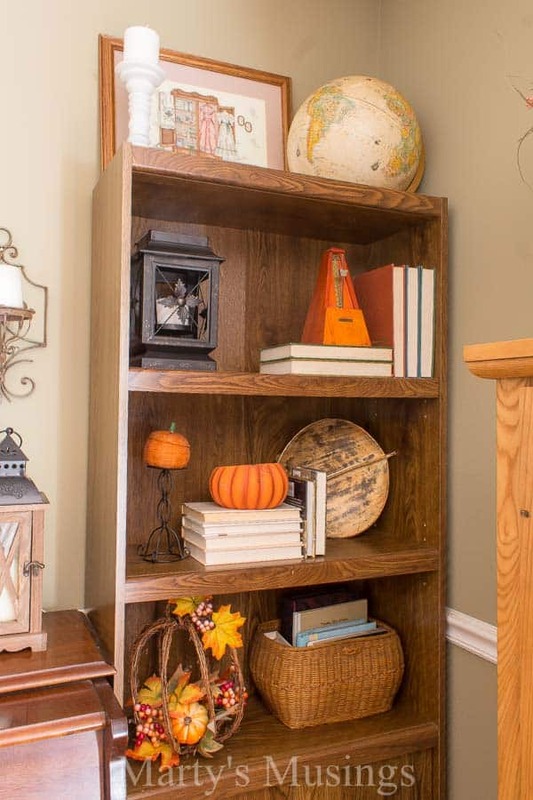 Fall Decorating Ideas for Under $10! 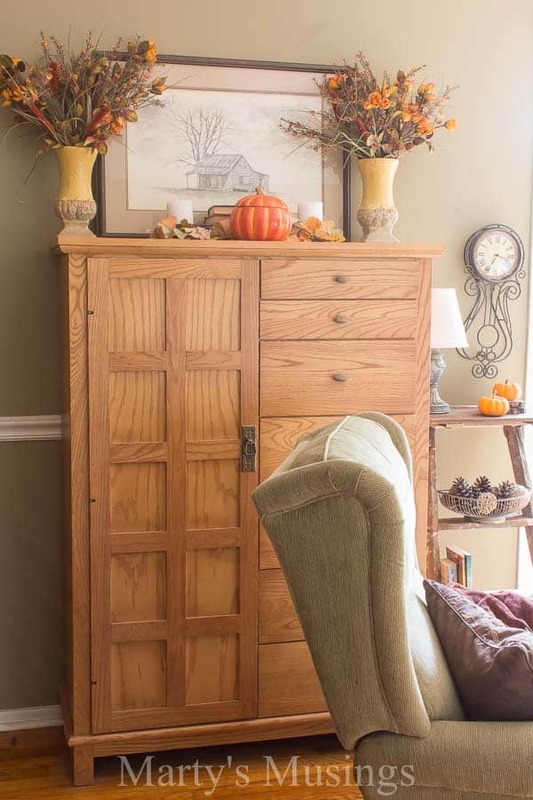 With just a few practical tips you’ll be on your way to a beautiful fall home. 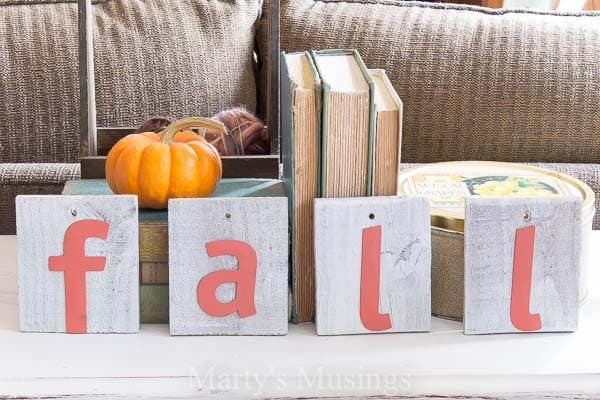 These fall decorating ideas for under $10 are both inexpensive and doable for everyone! The breeze blows gently through my hair, the leaves crunch under my feet and the air feels crisp and fresh this morning. I clasp a mug of my favorite Instant Russian Tea and my heart beats faster. My favorite season of the year is here! Actually, it’s began about a month ago but here in NC the little invisible person on my weather app didn’t get the message. 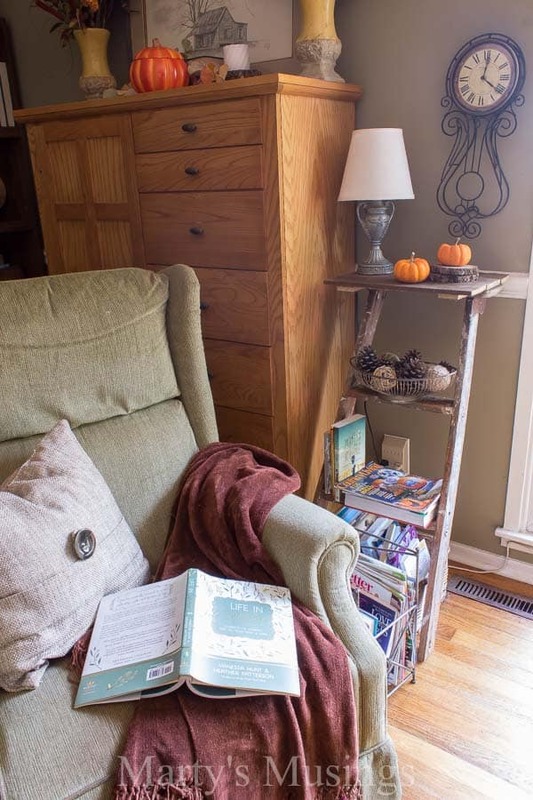 Fall arrived and the hot temperatures remained while my brain was immersed in behind the scenes blog details, learning new ways to share my latest DIY projects with you, my favorite people. As for my home? Until a few days ago there was a “Summer’s Here” sign on the front door. Yep. I’m a DIY home decor blogger doing everything backwards this year. 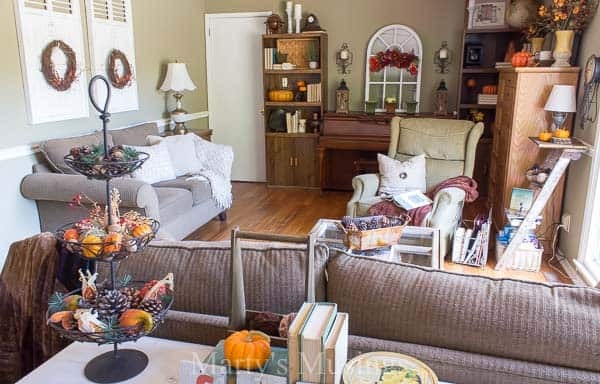 My “seem to always have it together” blogging friends put their fall decor up in August and were frantically scouring the countryside for pumpkins. Am I singing your song right about now? 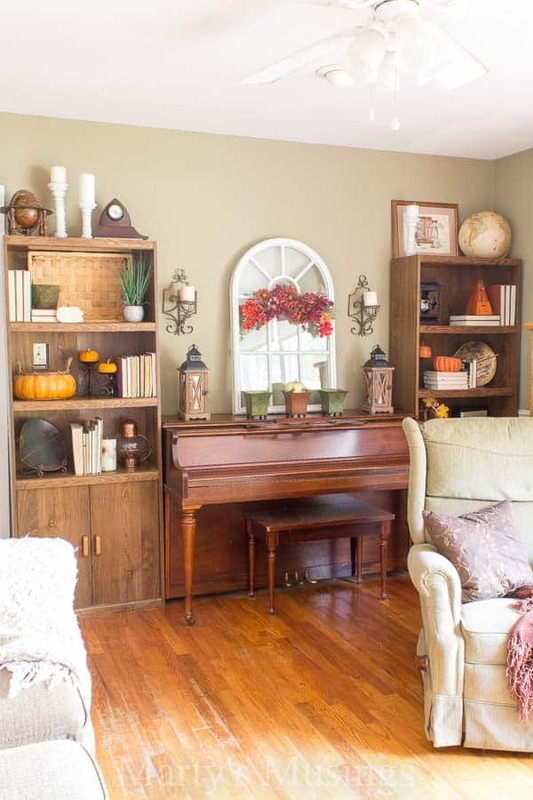 Good intentions, Pinterest boards full of great fall decorating ideas and all that jazz. Maybe you even purchased some craft supplies for you and the kids to make together because they were JUST SO DARN CUTE. It’s ok if you didn’t get it done. Life happens. A lot. 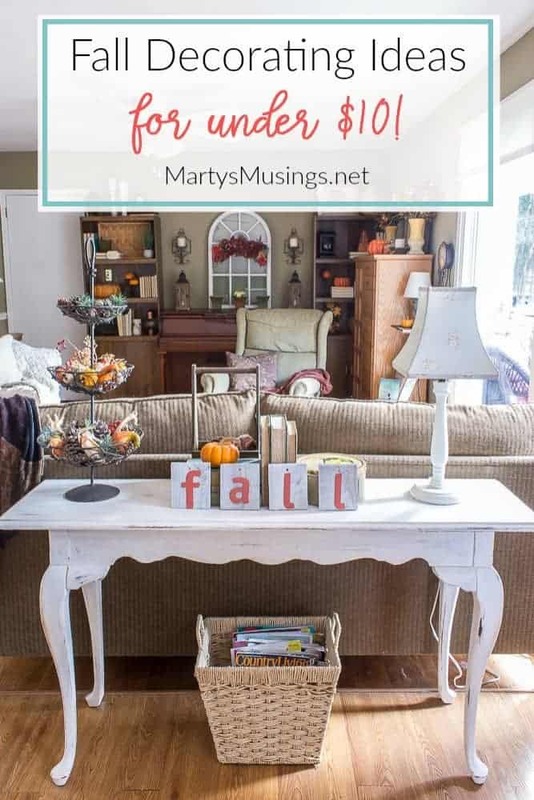 Give yourself a break today and let’s just do this together, with a few fall decorating ideas for under $10. 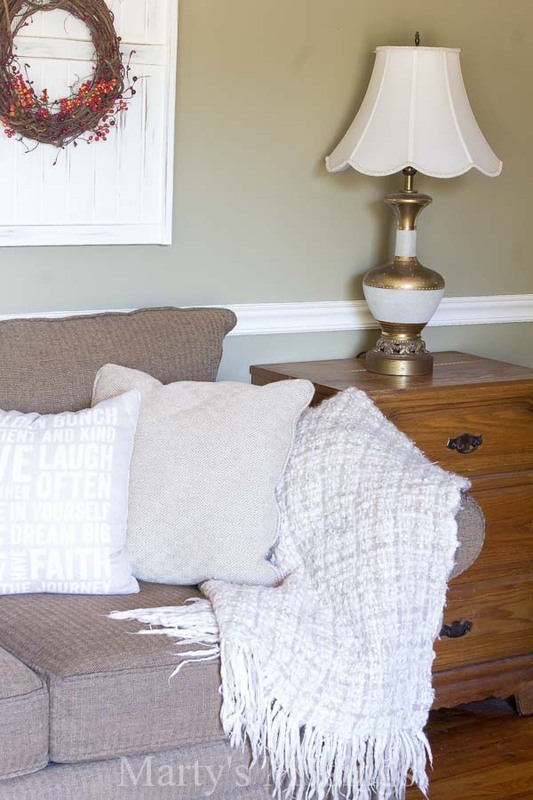 So many of you want to know how to decorate while staying on a budget so here’s how I do it. First of all, I always ask myself a few questions. 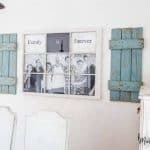 What do I already have in my decor that can stay? 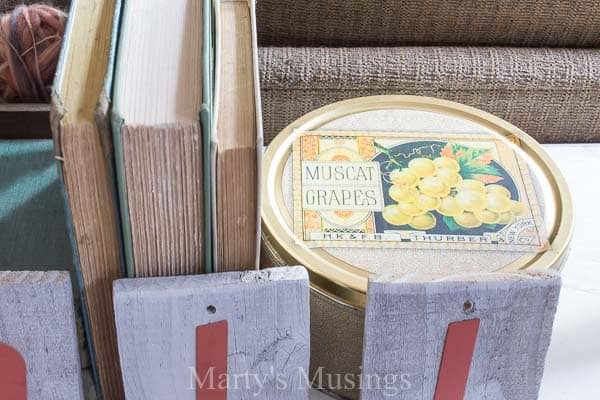 I added this yardsale tin as a bookend. So simple! 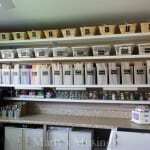 What great things are in my stash? What? You don’t have a stash? You’re going to have to work on that! 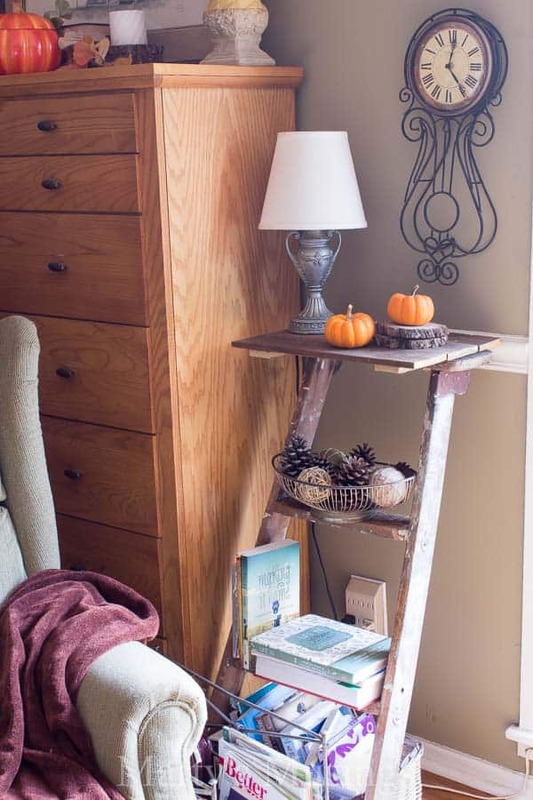 I balanced a $5 Pottery Barn yardsale lamp with a yardsale 3-tiered stand at the other end. 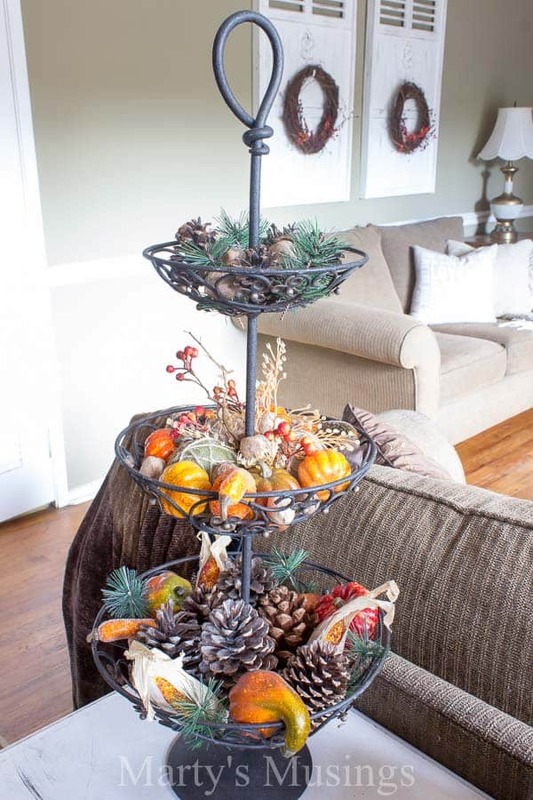 This stand has made its appearance on my front deck for Christmas and in other fall decorating. Pinecones nestle in beside artificial (aka fake!) elements from the craft store, bought at the end of the year sale. 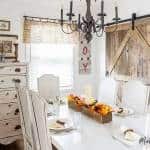 The burlap and string ball was bought on sale at Big Lots last year and will be making an appearance through both the fall and winter seasons. You’ll never guess where I got the floral swag from. A yard sale! I know. Surprise! 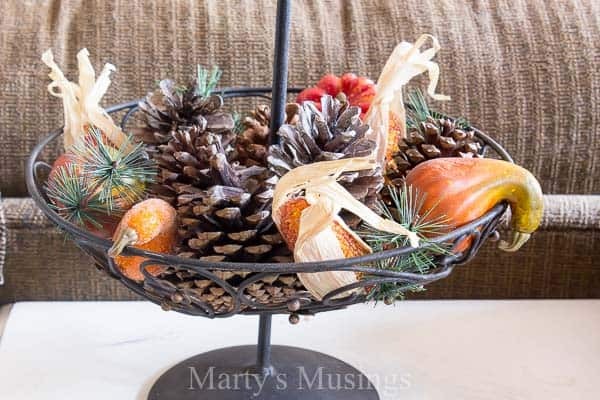 You can see how I used some of these same accessories in a fall table setting last year. 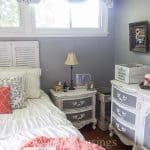 The vases and flower arrangements in this vignette were $1 yardsale finds and the picture was a gift to us many years ago when we were first married. It had been hiding in my attic stash for a long time but I love the way its simplicity lets the pops of orange shine! 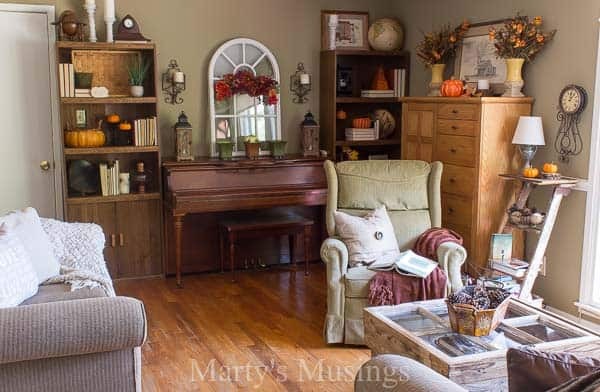 What do I need to purchase to fill out the rest of the decor? My only real purchase this year for fall? A couple of $4 bags of mini pumpkins from the home and garden store and two grapevine wreaths half off at the crafts store. For real. That was it! 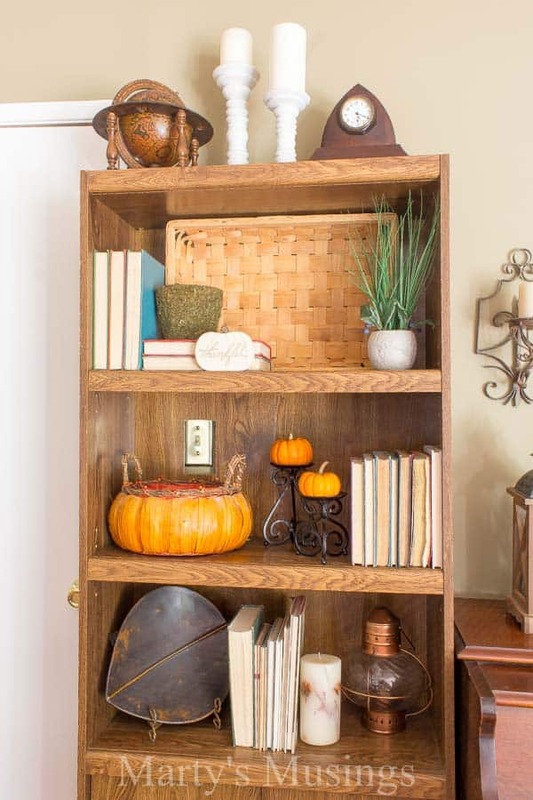 My DIY Step Ladder Shelf holds a couple of those pumpkins and a few rustic odds and ends. Casual and easy. 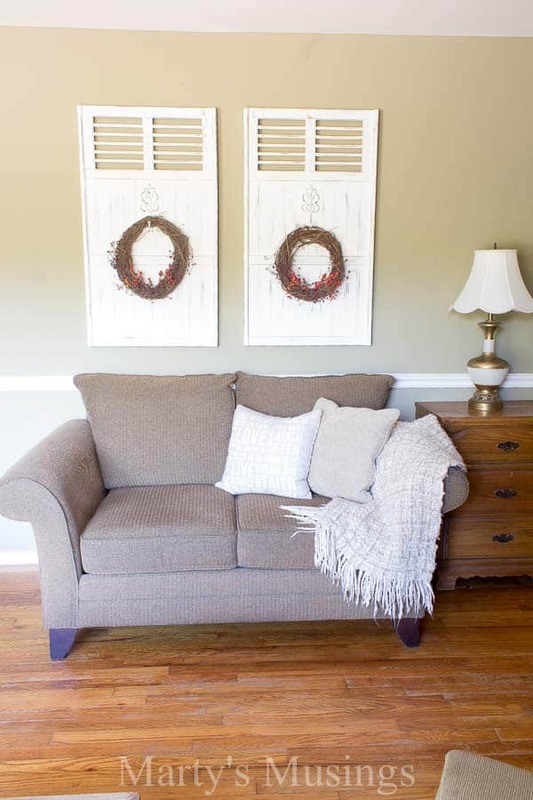 One of my all time favorite yardsale finds was these $1 shutters, now chalk painted and hung over the love seat in my living room. 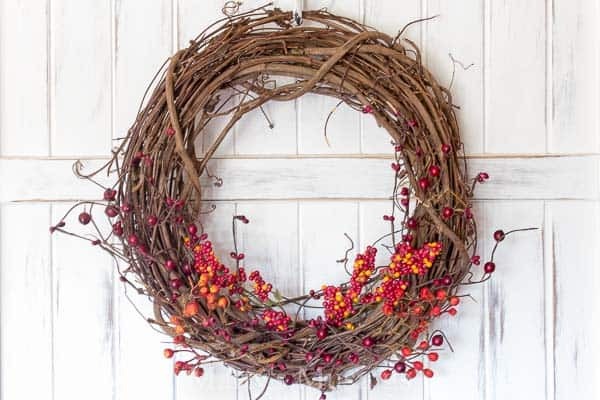 I’ve struggled with what to hang on them but these grapevine wreaths are perfect, decorated with some floral stems found at a you know where! This room is now officially decorated, all cozy and ready for a snuggly, relaxing afternoon. 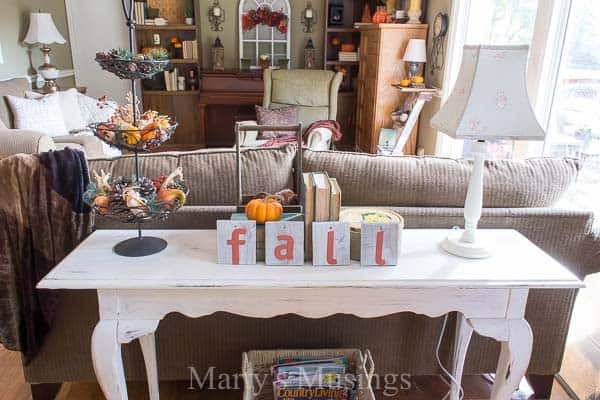 I really need to know, for my sanity’s sake, is anyone else just now adding a few fall touches to your home? 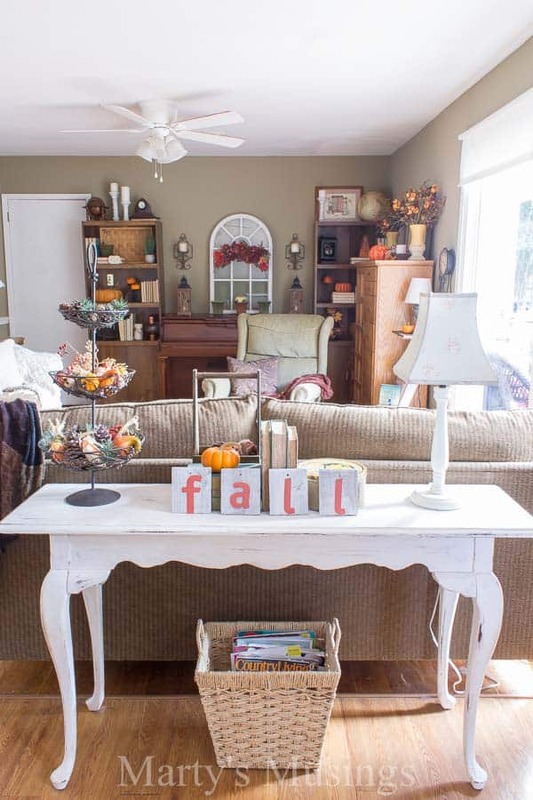 If this inspired or encouraged you I’d be grateful if you’d pin these fall decorating ideas or share them. But I’ll love ‘ya even if you don’t! Hi, Tracy. What wonderful memories you must have of your mom and grandma. My piano was passed down to me from my mom and I practiced on it through my entire childhood! Thanks for reading my blog and commenting! Your home looks beautiful and I am bowing to your thriftiness. 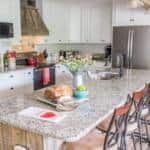 i also love all your natural touches – those are such wonderful ways to make your home feel ready for the next season. Thanks so much, Kim. 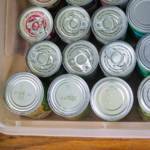 You are equally thrifty but you just do it in a little different way! Having a home built by your own hands is such a wonderful accomplishment. Truly takes the meaning of home to a new appreciation! Hey, girl! Thanks for being a late decorator like me. Better late than never and all that jazz. Love you too! 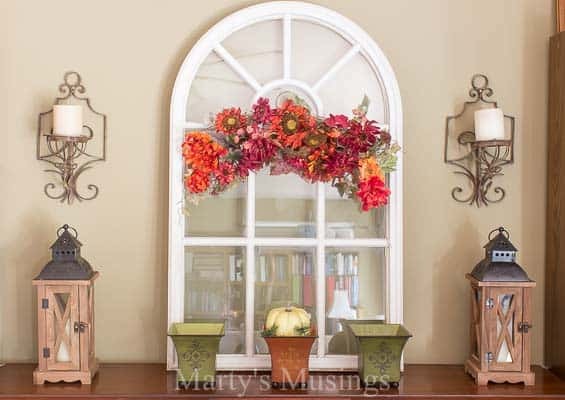 Great job Marty and yes I have added fall touches. I think I’m resting up for Christmas in which I intend to go all out. I do wish I could find great deals like you, like that lamp! Hi, Diana. It’s good to hear from you. I definitely agree with resting up for Christmas. We have a ginormous DIY project planned that is top secret but I think resting may be out the window for a while. I hope to be sharing it very soon. I can’t wait to hear about how you’re going all out, though! Very interesting and helpful. 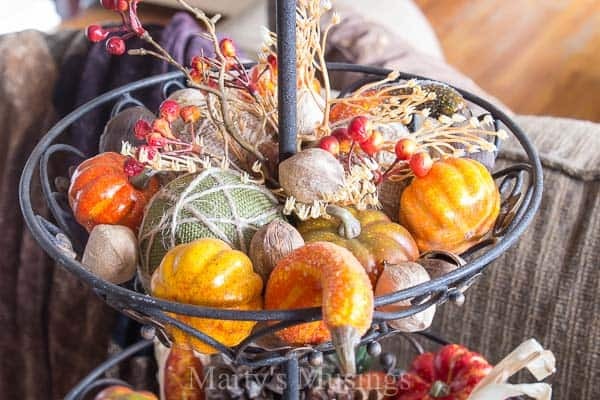 I have a big basket on the porch waiting to be adorned with fall things from Hobby Lobby I bought awhile back……does this count as decoration if it’s still in the bag?? Lol. One Item has glitter all over it! WHY did I buy that lol. Hey, Janet. Baskets certainly do count as decoration but you do have to take the stuff out of the bag! I love glitter of all kinds but I’m trying hard to resist it and go more a la natural. Although Christmas says bold and glittery to me! Hey, girl! Thanks for the compliment! Pumpkins in August means none at Thanksgiving! Of course by then Christmas has long taken over the world. Miss you!